Helenite is not rare. Anyone with a heat source can create it. 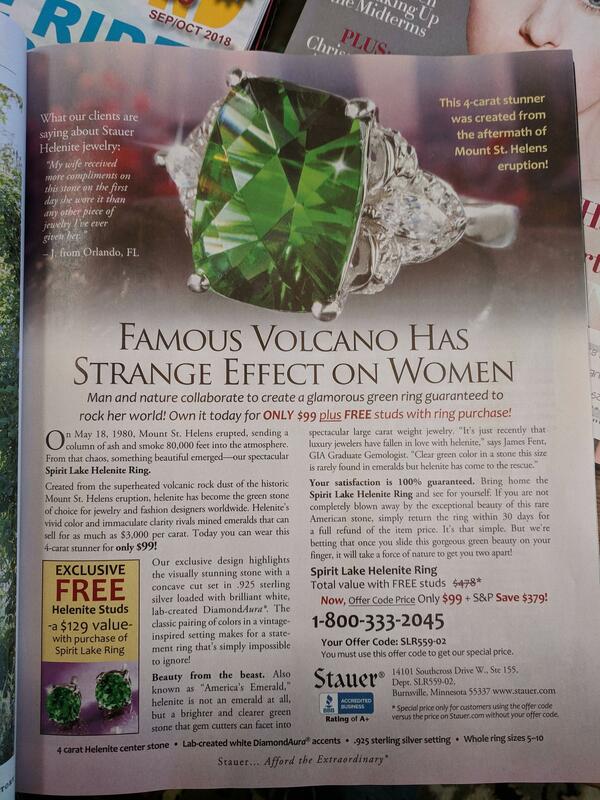 If you're looking for "unbranded" green or red manufactured obsidian made from that special mix of Mount St. Helens minerals [Illustrated Dictionary of Jewelry], you can also look for Mount St. Helens obsidian, emerald obsidianite, or gaia stone [Sciencing], in addition to the its trade name [Geology.com] of Helenite [Wikipedia]. I'm noticing a lot of words in common between the Wikipedia article and the GeologyIn link. Which one came first? If I added the GeologyIn link as a reference to Wikipedia, could I participate in my first case of citogenesis? ocschwar, thanks for the reminder. I had to go find the QI question about Icelandic volcanoes that include Brian Blessed trying to pronounce Eyjafjallajökull. I’ve hiked to the top twice and never knew there was UNTOLD WEALTH under my feet the entire time. Curses, hanov3r, for that excellent video that just had me giggling at my desk! The Helenite is beautiful, and all the more so for not being rare. On May 18, 1980, Mount St. Helens erupted, sending a column of ash and smoke 80,000 feet into the atmosphere. From that chaos, something beautiful emerged --- our spectacular Spirit Lake Helenite Ring. I wanted to then find out more about "Helenite." I did not expect to find a snarky geology article about the un-rare material. But I am sad that there are no good videos of ash being turned into a green stone, at least as far as I could find. Here's a low quality VHS copy of a local news spot on glass blowing with Mt. St. Helen's ash, except there's only a hint of green in the final product. Hmmm.... I wonder if I could make counter-tops or back-splashes out of it by using a home smelter, casting ingots and then suspending them in epoxy resin. Jewelry companies also noticed, and crafted an exiting story about discovered jems ..even though ...a five gallon bucket full of ash will make many thousands of carets of this so-called gem. So what you're saying is these jems are truly outrageous. Ahh, Stauer. I have a couple of nice watches they used to sell. They mostly stopped selling nice watches, in favor of a whole lot of jewelry made with sortaprecious stones and way-overpriced meh watches. Too bad. So, fundamentally, this is glass. It just happens to be glass made from volcanic ash, instead of more common sand. And like regular glass, mineral inclusions give it colors. That said, it’s beautiful glass! More jewelry should be made of such pretty glass, imho. Bullseye Glass (recently in the news for contaminating a chunk of SE Portland with heavy metals, but that's another story) made and still sells Mt. St. Helens ashtrays made from ash that dumped on Portland a few days after the main eruption, and has this green color. I've used Mt. St. Helen's ash as a frit in a cone ten pottery glaze. By itself, it has a similar color to melted coke bottles (anyone else of the right age to remember getting those at the county fair?). I ended up using it with tin oxide and fire clay to make an opaque white glaze similar to Bristol Slip. I seem to recall the ash was like ten bucks for a twenty-five pound bag from my pottery supplier, and most of that price was probably shipping from the west coast. I got more milage per customer patter per pound from that stuff than any of the more expensive and exotic compounds I used to use. People love to hear about volcanoes, especially on coffee mugs. This is really cool! Previously the only thing I knew about the Mt St Helens eruption was that it was what woke up The Ark/Auntie/The Autobots in the Marvel G1 comics timeline. If you look at old footage, the hucksterism of pre-eruption Mt St Helens is undeniable. The appearance of 'Helenite' marked the return of yet another trophic level as the ecosystems of the mountain continue to recover. So, Helenite was created when geologic subluxations were adjusted via tectonic applications of mantle chiropractics? The big question is, will it kill dragons? Asking for a khaleesifriend. The big question is, will it kill dragons? Don't be silly. Helenite is for launching ships. Just don't steal it, or you might start a war.